As the daughter of Kickapoo, Commanche and Macehual peoples who migrated across present-day United States and Mexico, Patrisia Gonzales specializes in Indigenous ways of knowing and Indigenous medicine. She obtained her Ph.D. in Mass Communications from the Department of Life Sciences Communication at the University of Wisconsin-Madison. Her works have been cited in various anthologies and scholarly endeavors and she has received various human rights awards for the national Column of the Americas (which she wrote for Universal Press Syndicate) and for her book The Mud People: Chronicles, Testimonios & Remembrances (Chusma 2003). Her scholarship examines Indigeneity from a hemispheric perspective; Indigenous communication practices; Mesoamerican symbols and codices as medicinal texts; and Indigenous medicine as a parallel system(s) of knowledge that challenge and expand the paradigms of Western Science. 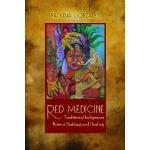 She teaches courses on Traditional Indian Medicine (TIM) and Mexican Indigenous Medicine. As a Kellogg Fellow, she explored community healing and Indigenous medicine and helped to establish a promotora project on traditional medicine in New Mexico. She is a promotora of Mexican Indigenous Medicine and an herbalist. She apprentices with Macehual elders as a Traditional Birth Attendant. As a “promotora-investigadora” or community health promoter-researcher, her courses and research combine applied Indigenous medicinal knowledge with explorations into under-girding philosophies and world views. She has collaborated with the Indigenous Birthworkers Network and Tewa Women United. She is an advisor to the Indigenous Institute of the Americas, a member of the Native American Indigenous Studies Association and the Native American Journalists Association, and a former board member of the American Indian Resource Center in San Antonio, Texas. She has received various grants to conduct collaborative research with Indigenous knowledge keepers on TIM.